Leaf-miner: The young larvae mine one or two needles. Later they live free in a communal web in which also much frass and remants of needles are stuck (Bladmineerders van Europa). 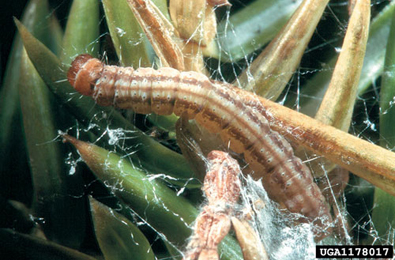 Larva: The larvae of moths have a head capsule and chewing mouthparts with opposable mandibles (see video of a gracillarid larva feeding), six thoracic legs and abdominal legs (see examples). The larva is illustrated in Bladmineerders van Europa. Pupa: The pupae of moths have visible head appendages, wings and legs which lie in sheaths (see examples). See Patočka & Turčáni (2005a). Time of year - larvae: Mining larvae in mid-summer; free living larvae till early summer of the following year (Freeman, 1967a) (Bladmineerders van Europa). Time of year - adults: Flies at night in July and August, coming to light (UKMoths). Distribution in Great Britain and Ireland: It occurs in suitable habitat in much of England, and in southern Ireland (UKMoths). Widespread including Bedfordshire, Berkshire, Buckinghamshire, Caernarvonshire, Cambridgeshire, Denbighshire, Dorset, East Kent, East Norfolk, East Suffolk, East Sussex, Glamorgan, Herefordshire, Hertfordshire, Huntingdonshire, Isle of Wight, Leicesetershire, Middlesex, North Hampshire, North Somerset, Nottinghamshire, Shropshire, South Hampshire, South Lancashire, South-west Yorkshire, Stafford, Surrey, West Gloucestershire, West Lancashire, West Norfolk, West Suffolk, Westmorland (NBN Atlas). Also recorded in the Republic of Ireland and Channel Islands (Karsholt and van Nieukerken in Fauna Europaea). Distribution elsewhere: Widespread in continental Europe including Austria, Belgium, Bulgaria, Corsica, Czech Republic, Danish mainland, Dodecanese Is., Estonia, Finland, French mainland, Germany, Greek mainland, Hungary, Italian mainland, Latvia, Lithuania, Luxembourg, Macedonia, Poland, Romania, Russia - Central, East, and Northwest, Slovakia, Spanish mainland, Sweden, Switzerland, The Netherlands and Ukraine (Karsholt and van Nieukerken in Fauna Europaea). NBN Atlas links to known host species: Host species unknown.